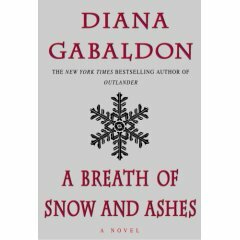 I was quite happy to stumble across Diana Gabaldon's A Breath of Snow and Ashes (ISBN 0-385-32416-2) recently and decided to give it a go, postponing Lincoln and etc. from my hopper to make way for it. (Sorry, Abe!) I was quite charmed by her Outlander book and the ideas she put forth - blending time travel, fantasy, science fiction, and wonderful prose along with some enrapturing characters to build a great story. However, her earlier grace and presence in words are sadly lacking here. While a kidnapping can be a dramatic plot device, did the story really need to include 3 such abductions? Strong and bold characters, such as Jocasta, are limited to pale and unsympathetic versions of their former selves, with no build-up to let the reader sympathize or enjoy the story of the hubris of the woman. The situation and story are sadly glossed over. Similarly, [spoiler warning!] the return of some characters to the modern day was discussed in only the broadest terms; the readmittance of them into society of the present day is given some hand waiving and left as a fait accompli for the reader to swallow down. Gabaldon's prose is admirable and her description of characters in relationships is charming, as ever. But overall, I was disappointed in this work, and am not sure if I'll take the gamble of a time investment for her other works. I may go back and read Outlander though!